Though it’s difficult to believe Mitt Romney was enjoying himself during Clint Eastwood’s casual RNC chair chat on Thursday, Stuart Stevens, Romney’s top message man, wants us to believe that the candidate was a fan of the improvised sketch. “I was backstage with him and he was laughing, thought it was funny,” Stevens told Politico’s Ginger Gibson. Ann Romney, not quite willing to go all the way to “funny,” told CBS’s This Morning that, “we appreciated Clint’s support and he’s a unique guy and he did a unique thing,” which is true as far as political conventions go. The skit was so pilloried, in fact, by pretty much everyone (with the exception of Rush Limbaugh , who called it a “bold” performance) that Romney staffers were loathe to admit responsibility for it. Stevens and his partner-in-strategy Russ Schriefer, who OK’d the cameo, say they gave Eastwood some talking points (some of which he incorporated) and a firm 5-minute time limit, which Eastwood exceeded by seven minutes. 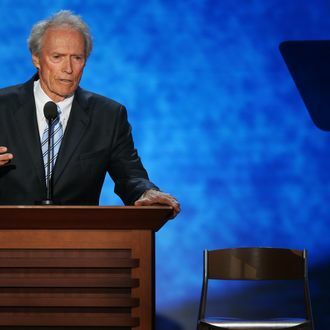 No one bothered to include Eastwood in the dress rehearsals. I never discussed, I mean, about a chair. It was an idea, a moment that moved him, I would say, and he went with it. … He hit points that he’d hit before in the funders and were good points. He just chose this narrative way to deliver it.